As Easter comes closer, the sun is shining and I am thinking about Easter flowers for the table and around the house. I like to keep it simple yellow spring flowers, as Easter is earlier this year there are still yellow daffodils, catkins and yellow Forsythia in the garden. For the table I am using egg shells and egg cups, arranged in a group of 3 or 5 they look fantastic. I also added a few little chocolate eggs, but they only lasted as long as my son was out in the garden!! 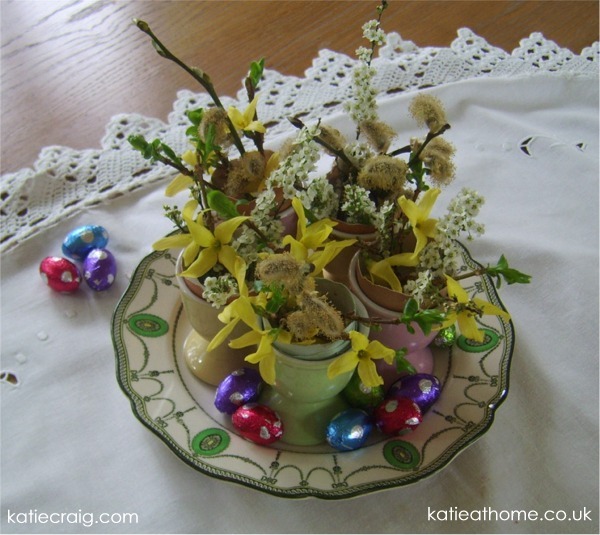 For a larger display I am using daffodils, and catkins and hanging decorated eggs on the branches.